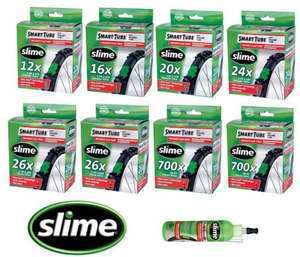 All SLiME Smart Tubes are factory-filled with a precise volume of SLiME Tube Sealant. Smart Tubes instantly seek out and seal punctures as they occur, preventing flats, repeatedly and continuously for up to two years. Ride without worries or the hassle of having to walk home. Please note that although renowned as an excellent product it cannot fix all punctures all the time so cannot be regarded as a 100% fix all solution. I have 1 of these inner tubes in my back tyre, not had a problem with it. Normal inner tubes always get punctured easily. Why so cold? Looks cheap to me. I've tried slime inner tubes and won't use them ever again. They work very well if you have a proper puncture but it you just get the tip of a thorn puncture the inner tube. It won't seal because the thorn goes in and out of the hole as the tyre flexes. Kind of like a sewing machine needle. If this happens you'll get slime everywhere and you'll end up swearing. Heat to the OPs post, as enthusiasts will want Presta and it's a better deal for multiple tubes.